2In the Nord-Pas-de-Calais region we have tried to set out a strategy for practices as a whole which will enable policies to evolve towards sustainable development. 3We are more fortunate and have more assets than other regions. Our first good fortune is a great ill fortune, in that the dominant economic activity of the last 150 years has completely devastated the region. Another aspect which is probably in our favour is that the area is relatively close to northern Europe, at the meeting point with the way of thinking of France and countries of the south. 4In addition, for many years there has been an active network of associations underpinning this favourable ground for sustainable development. There has been a long-standing awareness of the issues, and more recently the election of Marie-Christine Blandin as first regional President from Green Party has created opportunities for many of these actors. 5The experience of drawing up a sustainable development strategy in the Nord-Pas-de-Calais region is based on a process of participation between 1992 and 1998 which has led to a certain number of changes in developing public policies. 6For example, through a process that has mobilised more than a thousand people in several workshops, an official report was drawn up on ways of making a mutual diagnosis and identifying priority sites. Two inter-ministerial regional development committees then took over (“post-mines” plan). 7There have therefore been achievements in terms of method, and also of issue: for example, the policy for Regional Natural Parks, and the energy policy which enables local authorities to recoup their investment in solar and wind power etc. (through the Norcal energy banking system) and which for the last twenty years has enabled the region to stabilise its energy emissions (excluding transport emissions). Among these achievements can also be cited the secondary schools built to environmentally high standards, which are concrete examples of the concept of schools that can be totally deconstructed. A certain number of token actions are required to convince people to follow a particular path, and these secondary schools provide an outstanding example. Another example is decentralised co-operation which allows co-operative procedures to be set up, not to copy existing models but to help set up systems adapted to the region (such as lagooning rather that water purification plants). 8After the election of Michel Delbarre, there was agreement on the need to move towards policies of sustainable development. This is the objective of the delegation for which I have been given responsibility: beginning with sustainable development to show that it is broad-based, then moving on to the more restrictive approach of regional development and finally the environment, since environmental policies greatly strengthen those for sustainable development. 9The first and most complicated task was to try to find a definition of sustainable development, working together with the socialist, ecologist and communist parties. The idea was to start from needs, those of citizenship and of demand. This meant that the conditions under which the needs arose was fundamental to the approach. This is one of the most difficult things. The other elements are fairly traditional, other than having to repeat that development means above all economic efficiency. A certain number of our partners, particularly those more involved in industry, needed us to reaffirm the fact that sustainable development is not economically anti-efficient. The most traditional ideas are those of equity, social solidarity and demands. 10If sustainable development involves trying to analyse the impact on efficiency of a policy, we find ourselves faced with an extremely complicated situation of measurement and reference systems. The transversal principle is at the heart of the idea. 11Principles of public action have been defined, the political position strengthened. The process is a ‘noble’ one; the impact of what is planned is assessed as well as possible and then the politicians can make the choices. 12However, it is not enough just to discuss methods – they must be applied. A research programme was devised drawing on multi-disciplinary approaches. For certain issues, carrying out sustainable development is first and foremost a question of finding simple means to gain a true awareness of the situation, with the idea of making a diagnosis of the region, using indicators. Work on indicators was set up in the region. What we sought to do with the departments was based on the traditional model of criteria linked to the economy, social questions and the environment. The question was to know how public policies were produced. A chart produced by the departments showed that the indicator approach was not an assessment process. After this, a fund to help advance decisions for sustainable development was needed to put the procedures into action. 13So after having worked on method, process and support for all the actors, the question was how to spread and adapt sustainable development? 14This is the last part of the strategy: setting up a resource centre for sustainable development. To start with it was acknowledged that sustainable development presented a problem of benchmarks, of links between those with data and those looking for them. The idea is to look at what is being done in the regions, to create an arena for discussion around what can be considered as progress or not in sustainable development terms, and so gradually build up benchmarks. 15It is obvious that sustainable development presents a problem of change, of cultural revolution and change in behaviour as well as in method. It is essential to maintain the horizontal and the long term approach, while keeping up the attack until bit by bit ‘the Berlin wall’ of unsustainable development is finally brought down. 1 Vice-Président du Conseil Régional Nord-Pas-de-Calais, chargé du Développement Durable de l'Aménagement du Territoire et de l'Environnement, France. CARON, Jean-François. 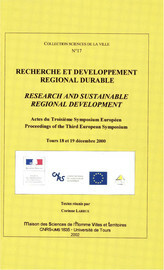 A regional viewpoint : Summary In : Recherche et développement régional durable : Actes du Troisième symposium européen. Proceedings of the Third European Symposium [en ligne]. Tours : Presses universitaires François-Rabelais, 2002 (généré le 20 avril 2019). Disponible sur Internet : <http://books.openedition.org/pufr/1320>. ISBN : 9782869063495. DOI : 10.4000/books.pufr.1320. Caron, Jean-François. “A regional viewpoint : Summary”. Larrue, Corinne. Recherche et développement régional durable : Actes du Troisième symposium européen. Proceedings of the Third European Symposium. Tours : Presses universitaires François-Rabelais, 2002. (pp. 149-151) Web. <http://books.openedition.org/pufr/1320>. LARRUE, Corinne (dir.). Recherche et développement régional durable : Actes du Troisième symposium européen. Proceedings of the Third European Symposium. Nouvelle édition [en ligne]. Tours : Presses universitaires François-Rabelais, 2002 (généré le 20 avril 2019). Disponible sur Internet : <http://books.openedition.org/pufr/1269>. ISBN : 9782869063495. DOI : 10.4000/books.pufr.1269.